This will not be part of the “Arrowverse” according to CW. Too bad, crossovers are the great draws of these kind of shows. Still, I’m hoping for a reasonably good portrayal of Black Lightning. I dig the light up costume, makes it stand out from the dark faux leather look of most of the Arrowverse outfits. Hate the mask though. It looks like goggles that don’t fit, keeping his face in a weird perma-squint. I think that looks great, but I don’t get why it’s not part of the Arrowverse? EDIT - Ah, this helps clear things up. Network president Mark Pedowitz confirmed The CW doesn't have plans for a five-way crossover. I mean, a little. I get all the reasons, but why shut that door? Just say it’s part of the 'verse but you don’t have to bring him into those other shows, but they could at least reference one another, from time to time? They want to keep batting 1000 (is that the expression?). If it fails, it’s unconnected. If it works… multiverse time. IMO. No, as the article pointed out, Black Lightning production is in Atlanta, all the other shows are in Vancouver. It was pitched to several networks, Fox committed to a pilot. So from the very earliest stages, everything about production precluded the idea of it sharing the “Arrowverse”. Fox eventually backed down, it was shopped around again, CW bit and they reshot the pilot anyway, but there’s enough in motion at that point that it makes sense it’s still not planned to crossover. Of course now that it’s at the CW, there’s a better chance that it could someday crossover than if it actually ended up on Fox, but the reasons it’s not going to start out that way seem pretty straightforward. The idea that they’d wait and see if it was successful before crossing over doesn’t really mesh with the realities of production. Eh they could easily make it apart later on. Supergirl started on CBS. The whole multiple Earths/time travel that shows like the Flash do allow them to write in pretty much whatever. Agreed, I just think they’re doing the smart thing setting expectations now that it won’t be connected. No one will complain later if it is. 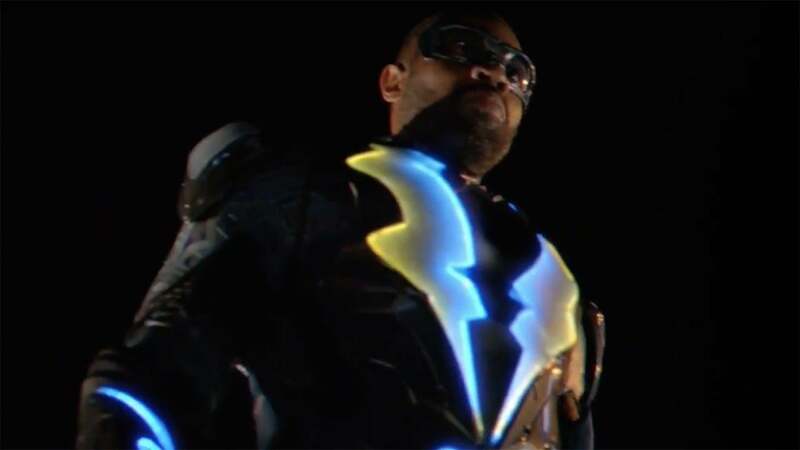 The CW has released a brief new promo for Black Lightning which reveals an updated logo for The CW series along with some intriguing footage of Jefferson Pierce in action. Hit the jump to check it out! Air date set for January 16! I watched this yesterday. It’s the first show that I’ve watched on the CW, I think. It was mildly entertaining. Good actors. But I don’t get the appeal. Felt a lot like Netflix’s Daredevil, where I feel like I’m wasting my time and could be watching something that’s actually interesting. Oh man nobody has ever described Daredevil better than this. I really enjoyed it! It’s a big departure from the other CW DC shows. Far more violent and with high stakes on a much smaller stage. I’m not a huge fan of his costume… (I kinda like the one he wore when he was younger better) …but I really like the character and especially Cress Williams, the guy playing him. He showed a lot of range in an hour. The bit where he said he was going to get his girls back to his ex while leaving his Principal’s office was awesome… and then unlike Arrow or Flash or Supergirl, it got WAY violent on the way into the hotel! Sheesh! Anyway, regarding the discussion up above, even though they’re filming elsewhere, it seems pretty obvious that they’re going to slot this into the universe even if there’s never a true crossover. He’s a metahuman. There are other metas. They definitely didn’t bother setting up his powers at all or the ones seen later in the episode. Being shot in Atlanta sure did make it look different too. A good thing. I’m in. It was good. I just need more time in the day to watch this stuff. Just watched the first episode today. Seems like it will be a fun ride and it appeals to both the comic book nerd and the social liberal in me. I particularly liked the last scene with its promise of Thunder joining Black Lightning. Pilots are always a bit uneven, we’ll see how the show progresses, but it’s got promise. I was impressed by soooo many things with this show, in terms of its maturity. And I find the main character a super-affable guy. It’s just… he doesn’t have much range. All the Marvel Netflix characters, even if their shows were so-so, Luke Cage, Daredevil, Jessica Jones, the leads are well developed and show a lot of humanity. Especially allowing for their flaws & understandable weaknesses. I didn’t get that w/ the lead in BL, despite how much I wanted to like him. He seemed too much like a TV actor Dad. Also, the action scenes were soooo terrible. I personally think the lightning suit looks ridiculous. I’ll keep watching, because I really appreciate where they took the show, how dark they let it become, and how human most of the peripheral characters are portrayed. Maybe it’ll grow into itself over time. So, I just watched this, being home sick these days, and waiting for Total Warhammer 2 to update, and I really enjoyed it, minus the superhero bits. This has become more and more common unfortunately, that the regular parts of superhero shows are pretty interesting, but the action bits are…well, boring, pointless, and mostly seems like powerfantasies of some sort and rather juvenile ones at that. I really enjoyed the lead, the girls, and the mom here, and thought it was an excellent setup, and would have loved something a bit more lowkey than, you know, killing 7-8 people, exploding a police car, and hospitalizing two police officers. I’ll keep watching, but depending on how much they take the action route, I may not stay for the duration, and thats a damn shame. OH, and it really looked bad quite a few places, but then again, I’m guessing this was a pilot episode of sorts. It is a difficult line to manage. Some of the Netflix stuff doesn’t have enough Superhero stuff and too much waxing lyrical at time. It’s like for god sake show me something you are almost a god. Flash seems to balance this well some of the later Netflix does not. If I am honest I like some action mixed in with my story it’s the balance that needs to be correct. The way The Flash does it is by interspersing usage of Barry’s powers into every day events. Some of the “action” is just him doing something fast that we all take for granted. More superhero shows should do that. Plus, they often really think about using his powers in different ways as the comics have shown throughout the years. I remember the first time he created the speed mirages we were blown away. More shows with comic book heroes need that kind of stuff. Not caught up on last night yet, but Ep. 2 was excellent. Just as good as the first. Loved the scene where he said he was gonna take the stairs. Lol!